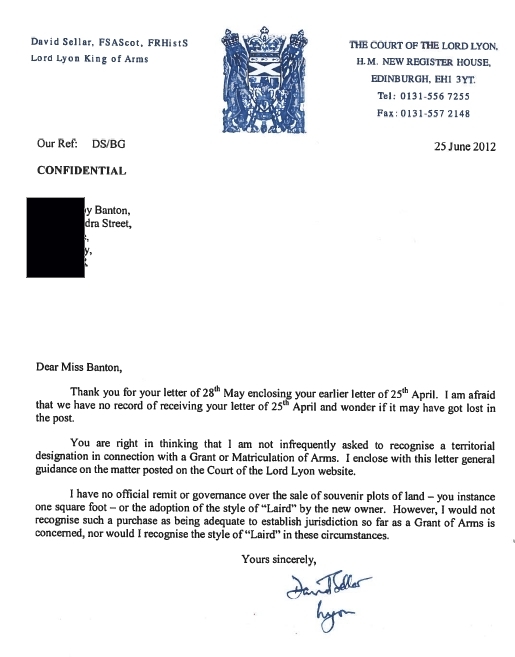 I have mixed feelings about the Lyon Court, in part because of their attitude towards our Coat of Arms which we have used for more than ten years and which we registered at some expense with the UK Government. The United Kingdom, of which Scotland forms a part, approves and protects our use of the device, whilst Lord Lyon cheekily asked us to pay him more than £3,000, for the privilege of displaying it in Scotland. We have the right to display it in Scotland, but after a fruitless exchange of opinions between myself and Alexander Green, the legal arm of the Lyon Court, we had to agree to differ. So as not to offend Lord Lyon’s sensibilities further, I agreed not to display our Arms in Scotland and he has kindly agreed not to waste our time further. The Lord Lyon based his right to interfere in how people display their Arms in Scotland on laws dating back over 500 years. They have not been used for hundreds of years and would undoubtedly fail if tested in court. It was very tempting to force the issue and have my day in court, backed by a human rights organisation, but there are usually more urgent issues to spend money on than making lawyers rich. A coat of arms is a unique heraldic design on an escutcheon (i.e. shield), surcoat, or tabard. The coat of arms on an escutcheon forms the central element of the full heraldic achievement which consists of shield, supporters, crest, and motto. The principal role of the Lyon Court is to administer the Public Register of All Arms and Bearings in Scotland – in other words he sells coats of arms to people and companies, for thousands of pounds a time. The sale of these Arms goes some way towards covering the costs of his department, but few people now consider that maintaining the pomp of the Lyon Court is a good use of money in a modern Scotland. We are pleased to have gained the support of SNP MP Corri Wilson for our campaign to clip the wings of Lord Lyon. She raised the issue at Westminster, asking the Cabinet Office whether it would review the operation of the 1592 Act in respect of the restrictions it placed on the “granting of arms”. Scottish Conservatives’ leader Ruth Davidson has also raised the issue with London. However, Minister for Constitutional Reform John Penrose said any questions of “judicial functions” were devolved to Holyrood. It is hard to believe that Nicola Sturgeon cares more about Lord Lyon than spending on public services so we can but hope for progress. I am a proud Scot and I think the Lord Lyon is a wee bawbag. He is there to protect the nobs and oppress the ordinary folk. The Lord Lyon’s role (despite applying solely to Scotland) is partly reserved to Westminster; because of the Crown’s ability to grant honours. The Scottish Parliament’s view is that the required change in the law can only be made by Westminster and the English are happy to leave us Scots swinging in the wind. The time has come for all true Scots to rise up and fight against these posh turds.